Moreover, material changes made to an ATS’s workings must be filed 30 days prior to planned implementation with the SEC. The SEC could then begin a process of review, where – based on findings – it might even decide to declare a Form ATS-N ineffective. These changes come in the wake of a series of fines that have been levied on numerous dark pool operators (including Liquidnet, Pipeline, ITG, Credit Suisse, Barclays, GS, UBS, and BAML). We highlighted some of the keys to the new rules above. Some key points concern order segmentation, colocation arrangements, and importantly, arrangements between liquidity providers and the pool operator (fees/rebates) and hopefully disclosures around the existence of prime broker relationships. 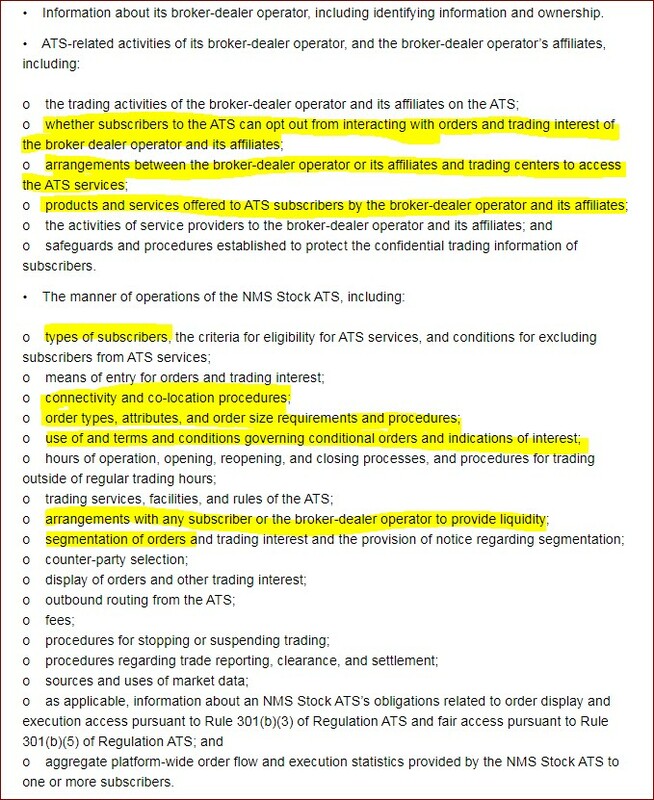 It is important to note that these rules apply to ATSs, which account for about 12% of trading volume, and not to “ping pools” – the off-exchange routing that occurs between your routers and high speed liquidity providers, which accounts for about 25% of trading volume. She apparently doesn’t like the “pervasive verbosity” problem at the SEC, and she doesn’t want to see any “merit regulation.” In fact she is known as being highly conservative with an anti-regulation bias. One of the giant “innovations” that dark pools have brought us in the last decade has been abuse shrouded in anonymity and complexity. But don’t take our word for that – take a trip down memory lane to revisit the SEC fines leveled against BAML, GS, UBS, CS, Barclays, Citadel, Liquidnet, ITG, etc. Perhaps we need more “meritt regulation” and not less. 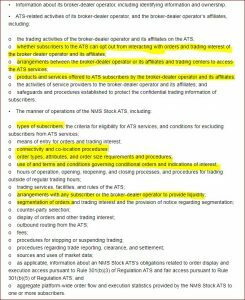 We imagine it is very hard for the SEC staff in Trading and Markets to not be ultra-thorough and well-researched crafting rules and proposals, especially when HFTs and stock exchanges persistently threaten the SEC with lawsuits. Trading and Markets under Brett Redfearn is doing a fantastic job. We are sorry that Commissioner Peirce thinks they are pervasively verbose. We have had several Commissioners over recent years who have been very anti-regulation. They prefer to not regulate and instead wave an “I don’t believe in regulation” flag. Newslflash – markets are extremely complex, with more conflicts of interest than ever. Why take a job as an SEC Commissioner – why even throw your hat in the ring – if you believe in backing off and letting the markets figure it out? 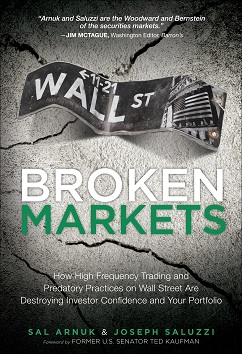 Markets have figured it out alright – secrecy, compelxity, economic clout of a few participants that each trade near 20% of the volume, and abuse. This makes it expensive for investors who have to spend substantial resources policing their orders in a market in which the SEC has the power to clean it all up. Its great to have an anti-regulation bias. Diversity of opinion is fantastic. But perhaps this is a flag that should be waved in the bleacher seats, and not in the arena by the actual referees. The SEC has a mission to protect investors – to police and referee. They are supposed to “merit regulate”. Do you want to play on a football field with no rules, except forcing all players to disclose that they intend to cheat and engage in bad behavior? We don’t. Milton Friedman and Free Markets are admirable. However, we haven’t seen anything close to resembling free markets – with their true innovating power. We have exchange oligoplies catering to outsized participants who prey on real investors. If someone were hell-bent against regulation, we would think the SEC is not the type of place they should want to work. Hell – if you were vegan would you want to work in a butcher shop? We applaud the SEC for implementing these long-needed disclosure improvements in the trading space, and we look forward to also seeing related improvements around market quality and order routing (Rule 605 and 606) just around the bend. The current Trading and Markets regime is a breath of fresh air, especially considering that the prior heads have gone to work at Citadel.